Borrowed from the google machine. Rights are not mine. Also borrowed, also not mine. Please don’t sue, all my money goes to feeding my monsters. 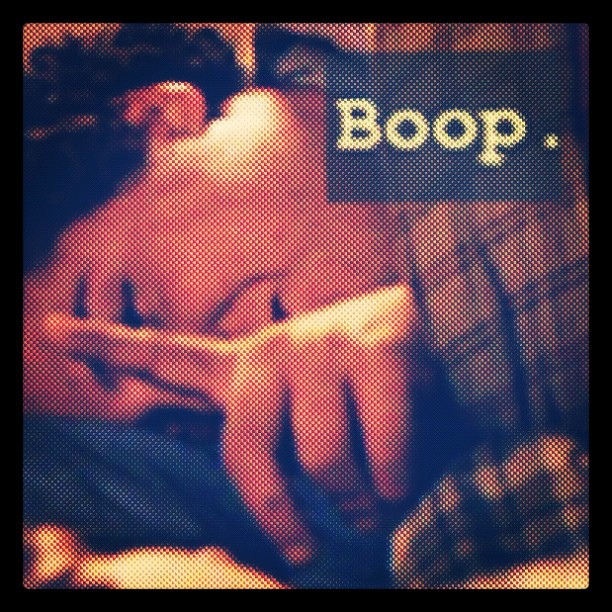 And there you have it; we coined the term “booper”. Obviously we have excellent senses of humor–but the catalyst behind this funny phrase sadly isn’t that funny. I am happy to report that our God awful couches were replaced the very day this picture was taken. Finally! It took probably a good 6 months before Maggie really began to relax in our home and her true colors started to show. I can’t honestly remember the first time that it happened, but one day Maggie and the other two were running from one room to another, riled up about something outside, and Maggie did this weird snarl/snap at them and kept running. It was hilarious! She didn’t make contact with either of them, she just made a funny sound with a little snap of her mouth, and they all kept going. Hello boop, nice to meet you. 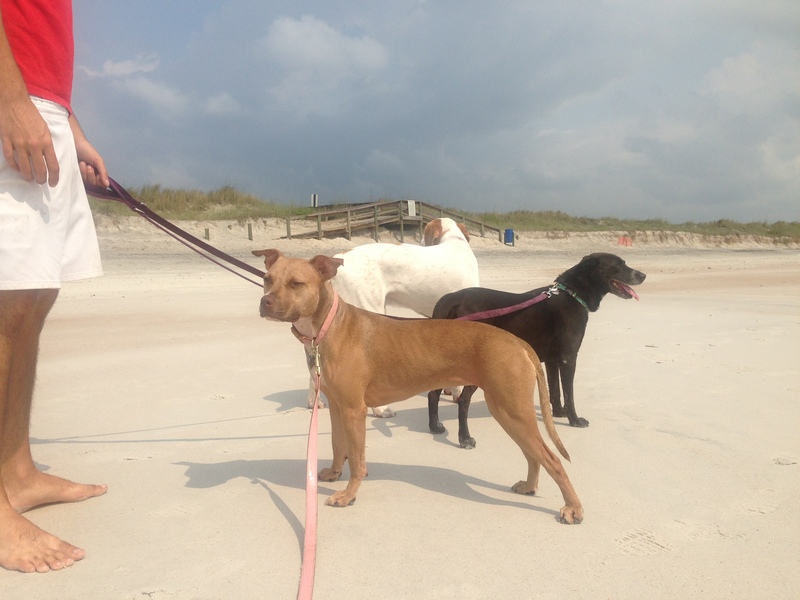 We were so sad when we arrived at the beach and they informed us that they strictly enforce leash laws. We made do the best we could. 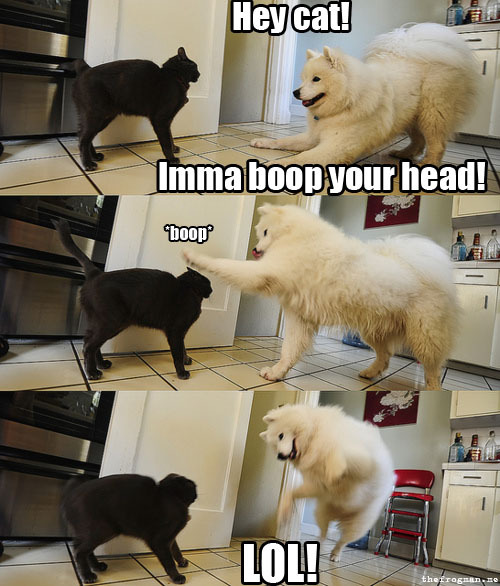 The “boop” continued to make appearances, few and far between, and I basically did nothing but laugh at them because they were always seemingly random, quick, and without consequence. It wasn’t until after this horrible event that I began to grown concerned about the booping situation. Don’t get me wrong, I could see from the get go that the boop was some sort of redirected aggression/frustration (due to whatever it was that was outside that they wanted to get to) but I assumed that my two good-natured, steady-as-a-rock dogs would always just ignore little Maggie. No harm, no foul kind of thing. Well after the fight (which I still firmly but sadly believe was Tag’s fault, and completely unrelated to “booping”) I began to consider the potential consequences to Maggie’s actions. Nothing happened between the time of the fight and our move into the new house with a nice yard, but the boop continued to make little random appearances and I did my best to discourage them. Now that we have this big back yard for them to run around in, the boop is continuing to make appearances, but this time at top Maggie speed–which is fast and generally results in her barreling into someone at the end. I can see that the other two are getting annoyed with it. And after a boop I can sometimes see that she has a stressed, wide eyed, trembly face too, and I’ll grab her and calm her down. This is rare but afterwards she always goes up to the dogs and does her best “I’m-super-submissive-and-so-sorry” face-kissing, flopping-on-her-back act. And the incident is over. So concerned about the squealing children. I know that the dogs all love each other, enjoy each others company, and are probably the happiest they have ever been (thank you big back yard!) but I feel like it’s time to put an end to this booping before, God forbid, something bad does happen. So, fellow dog owners/lovers have any of you experienced this with one of your dogs? Do I seek professional help? I am a firm believer in positive reinforcement, so I always praise them when they are all playing nicely and Maggie runs around boop-free, but it’s not stopping the behavior. Any ideas or recommendations would be so super appreciated! Oh, and Happy Hump Day! 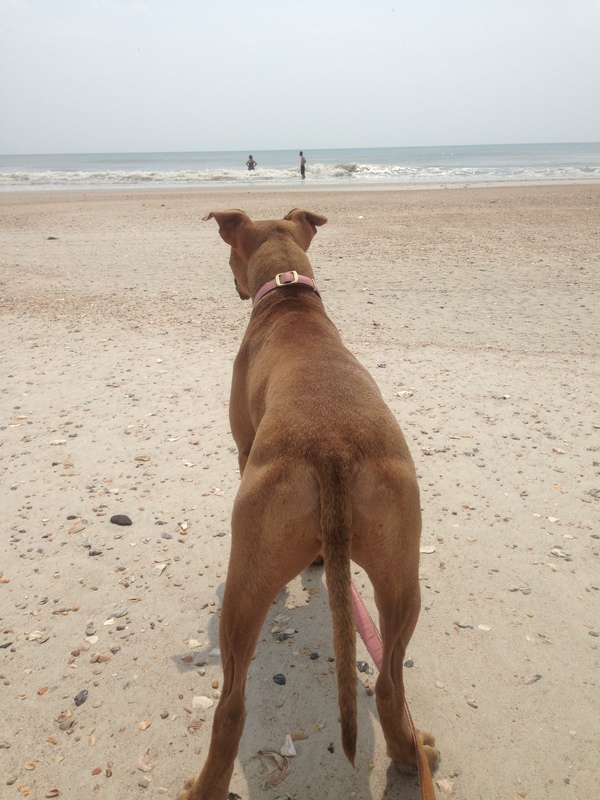 This entry was posted in Dog Lovin' and tagged Aggression, Beach Pictures, Booping, Dog Training, Dogs, Redirection by Morgan. Bookmark the permalink. Loved the first set of photos. Too funny. Sad that the booping is causing issues your side though. Is Maggie on an adrenalin rush by the time it happens? If so, it’s very difficult to stop any behaviour once the adrenalin is flowing. Easier to put a stop to things before they even start. Maybe she needs to be kept a little calmer. So difficult to say when you can’t see it happening. The thing is, it really isn’t causing issues, I’m just afraid that the potential could be there. I agree that it’s probably related to an adrenalin rush….but how in the world do you prevent things like a door bell ringing or a squirrel on the fence? You’re right though, I should probably direct my focus at keeping her calmer. Surprise, surprise, I can totally relate to this. Gia girl does the same thing occasionally. For her, it happens when the other two dogs are wrestling or rough housing. She will reach out and kind of snap at them and/or barrel straight into them. To me, it seems like she just really wants to join in on the fun, but doesn’t know how to do so. It makes me sad 😦 She never connects with her mouth, and she also exhibits stressed behavior afterward. 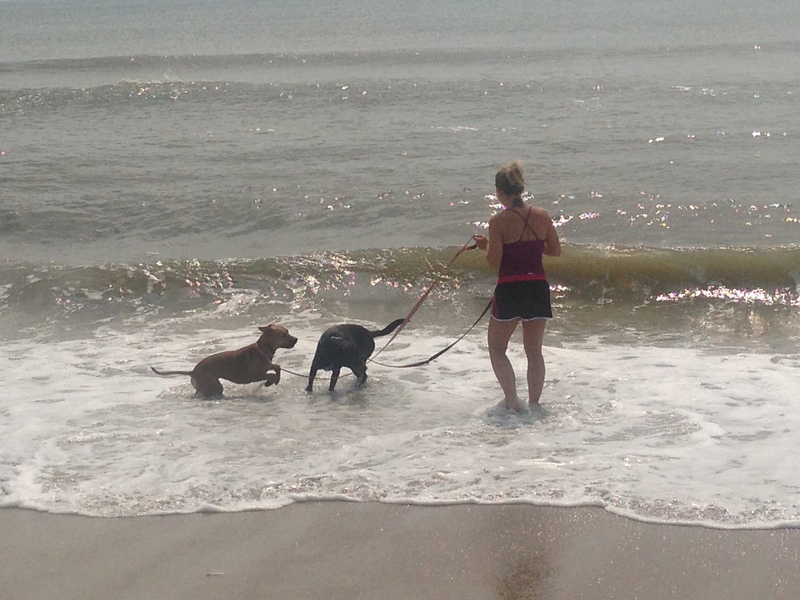 I try to help her learn how to play with the dogs by showing her how to join in and reassuring her that it is ok. 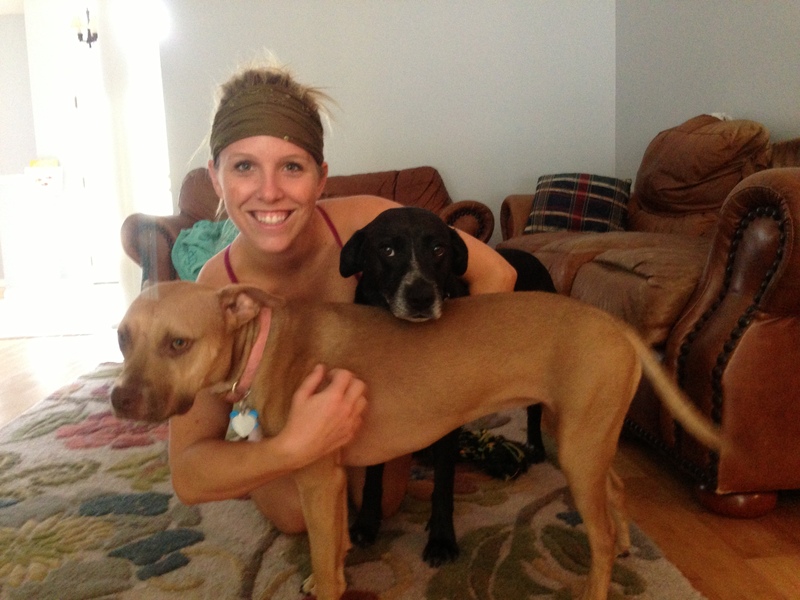 It may sound cheesy, but a positive reinforcement trainer told us that when a dog is showing minor defensive aggression toward another pup in your house, to stand in “mom stance” over them with your arms crossed. It shows disapproval in the behavior, but doesn’t punish them or stress them out anymore. It has helped with our girl! I also tell her “it’s ok” when I can see her starting to worry, and I swear that once I acknowledge her concerns, she visibly relaxes. Poor Gia, it does sound like she wants to join in but isn’t sure how. That’s amazing that the “mom stance” and reassurance help so much! I am absolutely going to start the mom stance next time it happens. I always do my best to reassure Maggie, but it does nothing to stop it, so hopefully the mom stance will! Thank you (as always) for your insight! How amazing that your pups are loving their new backyard and I feel you on the leash law thing, so annoying for responsible dog owners who want to let their dogs run! When Kaya was younger she was getting into terrible fights when play got too intense. I know Maggie is certainly not getting that far but I took Kaya out of play sessions when they got too crazy, leashed her and rewarded her for being calm nearby. Another huge help was getting her interested in tennis balls. She plays so nicely when she’s holding the ball in her mouth. Maybe Maggie has a favorite ball or toy she can hang onto? One other idea is, maybe there is a way to set up scenarios to practice with, like having someone ring the doorbell and reward her for staying calm when she hears it. If it only happens when she’s running around maybe you can teach her a word for “awesome treat” so if she’s running along, say the word loudly and toss a juicy smelly treat her way. Just some ideas, I know what you mean about it not being a big deal but also not wanting it to lead to tension in the group!